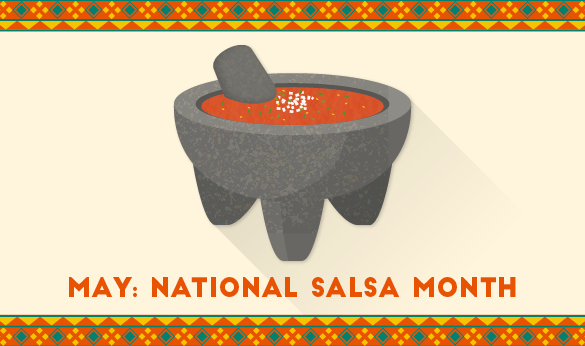 There seems to be a celebratory month for almost everything these days, and salsa is no exception. May is National Salsa Month, celebrating a food that has become one of the most popular condiments in the country. Salsa has a long history, with Native Americans such as the Aztecs making tomato-and-chile based blends potentially for centuries before the first European explorers arrived. Mixes involving tomatoes, chiles, and ground squash seeds were first documented in 1529 by Spanish explorers describing foods prepared by Aztecs. 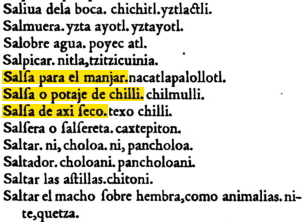 The word ‘salsa’, which means ‘sauce’ in Spanish, was used to describe the dish by Alonso de Molina in 1571 in his dictionary of the Nahuatl language, a resource still used by scholars today. From there, its popularity only grew. Pace was founded in 1947 by David Pace. The company had previously been selling a variety of jellies and syrups, but Pace became focused on perfecting his salsa recipe. Sales of salsa soon outstripped the company’s other offerings, so Pace dropped everything else to focus on what he called the “syrup of the Southwest.” Though the company went through some growing pains, popularity of salsa exploded during the 1980s, and by the early 1990s it surpassed the traditional American condiment king, ketchup in sales dollars, though not in volume. Pace’s original sauce was called a ‘picante’ sauce, named after the Spanish word for flavorful or spicy. The company still sells the original recipe picante, but has also added lines of traditional and specialty salsas, with the latter group including ones that make use of ingredients such as peaches, pineapples, mango, corn, and more. In 1994, the company was bought by Campbell’s, and in 1997 the company established National Salsa Month as a way to celebrate the 50th anniversary of Pace’s inception. •Salsa Verde, made with tomatillos in place of tomatoes. •Pico de Gallo, a chunky concoction made of coarsely chopped tomatoes, onions, and herbs that is often used as a topping rather than a dip. •Salsa Cruda, made with similar ingredients as pico de gallo and salsa roja, with a texture that falls in between the two. 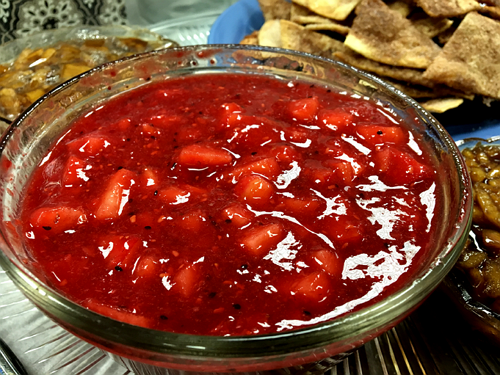 •Salsa Ranchera, made of cooked tomatoes and chiles, is generally served still warm. •Mole, which is made from chilies, unsweetened chocolate, and almonds. •Guacamole, which has also become very popular in the US, is often considered an avocado-based salsa. This wide variety of salsas offers a great opportunity for enterprising restaurateurs to celebrate National Salsa Month while drawing in curious foodies. One such restaurant in Chicago held a salsa tasting in 2015, and partnered with a salsa dancing instructor and a local DJ to make for a fun event. Innovative chefs have created salsas that use various non-traditional ingredients as the dish’s base in place of tomatoes, creating specialty salsas that have grown in popularity across the country. Because most jarred salsa found in the US is of the tomato-based variety (and because I am too weak to handle spicy food), I thought I’d try a couple of the more nontraditional dessert salsas, and of course some sweet tortilla chips to go with them. Both salsas were fairly quick and easy to make, and came out tasting fantastic. Add strawberries, raspberries, and kiwi to a food processor or blender and mix until smooth. In a large bowl, mix berry blend, apple chunks, marmalade, and sugars until combined. 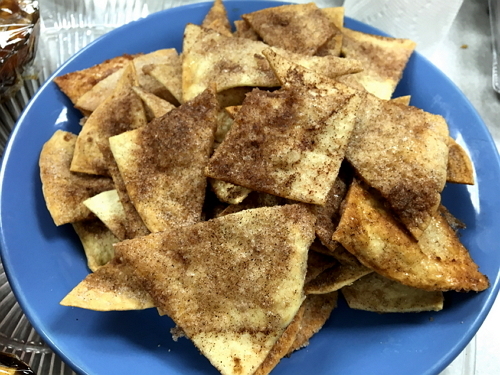 Serve with cinnamon sugar chips or tortilla chips. Recipe adapted from Frosting and a Smile. 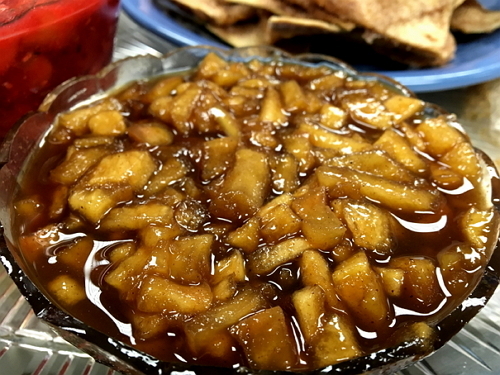 Combine apples, lemon juice, brown sugar, butter, cinnamon, and nutmeg in a large sauté pan. Cook on medium for 20 minutes, stirring occasionally. Add cornstarch and cook for 2 minutes, stirring occasionally. Brush each side of tortilla with melted butter, then coat both sides with cinnamon-sugar mix. Cut tortillas into wedges (easiest with a pizza cutter). Spread chips on an ungreased baking sheet, then bake for 14-16 minutes. Allow chips to cool before serving.